Despite the fantastic year that Jake Ryan is having, Michigan's most improved defensive player is still Quinton Washington, with a bullet. Washington, along with Will Campbell, are major reasons that Michigan was able to shut down Le'Veon Bell against Michigan State. 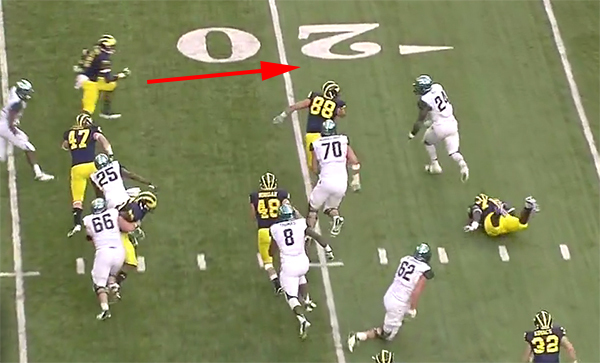 What follows is another piece of evidence in favor of Quinton Washington for President and one of the best examples of a Michigan defender getting off a block to make a play that we've seen all season. Michigan has just punted after a three-and-out following Michigan State's only touchdown drive of the game. 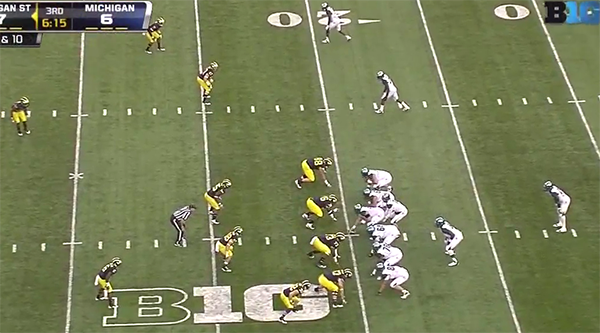 MSU comes out in a two-wide I-formation look. 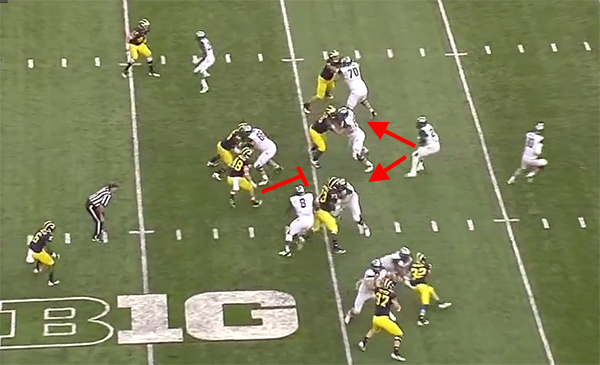 Michigan is in its pseudo-nickel with Jake Ryan lined up over the slot receiver and only two linebackers in the box. Michigan's defensive ends are shaded just outside the offensive tackles while Will Campbell is covering the strongside guard and Washington is in the weakside A-gap. As the ball is snapped, Washington engages the right guard (highlighted). 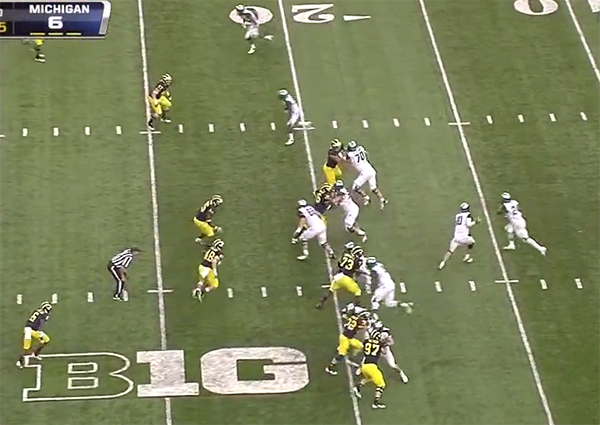 The MSU center is chip blocking Washington before releasing to the second level. MSU is running a weakside-iso. 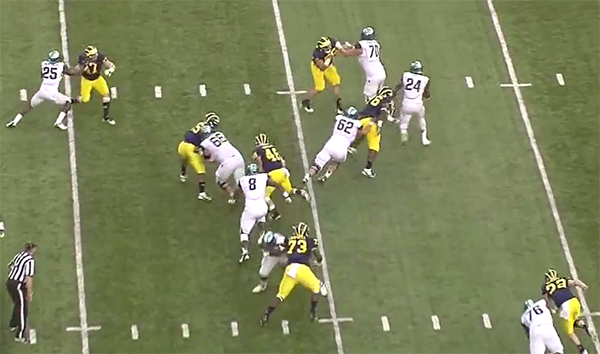 MSU's center is now releasing to the second level to block Kenny Demens. Washington and Roh and singled up on the MSU right guard and tackle, respectively. This is the moment of truth for Le'Veon Bell. He has to make one of two cuts. Desmond Morgan is in good position on the backside run fill, but he's only able to fill this hole because Will Campbell has stopped the MSU left guard from releasing to the second level. Bell is forced to cut to his right. But Bell didn't expect Washington to annihilate the MSU right guard. The lane that was clear for Bell a moment ago is now occupied by Washington. 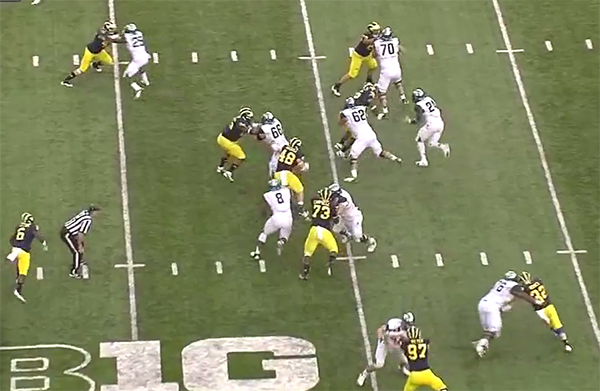 Bell is forced the bounce the run outside again, but Craig Roh is getting good push on the MSU right tackle. Washington is now lunging to tackle Bell. He won't make the tackle, but he's already accomplished his goal. In a moment, you'll see JT Floyd flying downhill as Bell tries to bounce outside Roh. 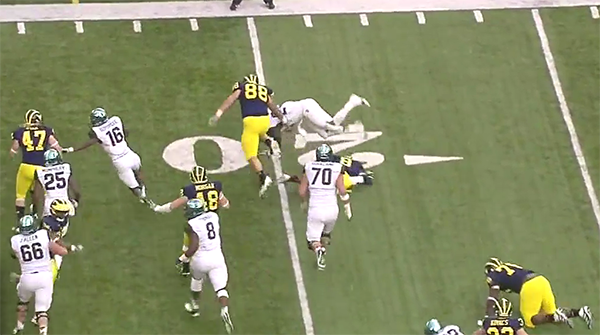 Bell has now totally broken contain, which allows Roh to release from the MSU right tackle and chase Bell. Floyd is now the contain defender running downhill to tackle Bell, but he's making sure to maintain outside leverage. But why keep contain when you can just chop down Bell mid-stride? I'm starting a Kickstarter. It will raise money to buy Greg Mattison pies. Let me know if you're interested. When coaches talk about players needing better technique, getting off blocks better, and maintaining leverage, this is the play that they show in the film room. It all starts with the defensive line: Will Campbell nullified the MSU left guard allowing Desmond Morgan to fill the backside run gap; Craig Roh kept outside contain, forcing Bell to bounce to the sideline and allowing Michigan's secondary to come downhill and attack the ball carrier; and Quinton Washington stayed firm on his blocker and was able to shed the block to cut off Bell's primary running lane. This is the kind of performance the defensive line has been turning in all season and something that was unthinkable two years ago. The discipline to stay in the proper lanes is one thing, but Campbell recognizing he needs to stop the MSU lineman from releasing to the linebackers and Washington's ability to toss aside MSU's blocker in order to make the proper run fill are examples of coaching that the team didn't get under the previous regime. This was a great stop by Floyd, a couple years ago he would've waited three yards away for Bell to come to him and then try tackling him up high or either get juked...good to see his improvement this year.